Olive Charky, full of malarkey, how will your garden grow? …and pretty lavender all in a row? Flavoured mint and gorgeous lavender found at Sheridan Nurseries. …and Russian Blue potatoes all in a row? Gourmet seed potatoes, garlic, and onion found at Terra Greenhouses. With locally-grown, heirloom tomato seedlings all in a row? About twenty varieties of beautiful, heirloom tomato seedlings available at Heatherlea Farm Market. I’d love to hear how YOUR garden will grow! I love to have our extended family gathered around us, joined together by food at a family feast. That’s how I imagine heaven, all of us together again, around the table. We’d wear silly paper hats. We’d crack up over my brother’s humour and marvel over my father-in-law’s poetic recitals. Roast turkey and my Mom’s Sage & Onion Bread Stuffing would scent the air. My Grandma’s Stained Glass Window Cake and my Nana’s Carrot Christmas Pudding would make a grand entrance. I’d peer through the elbows on the tables, at the smiles of all my loved ones. I have wonderful memories of my Mom and I cooking our family feast in her kitchen. While my Dad sang Silver Bells in the background (happy to be the errand boy), Mom and I would talk for hours as we wrestled with the bird and happily cooked our way through our family-favourite casseroles and all the fixings of a holiday feast. I loved it when my Mom asked me to taste-test her stuffing: “is there enough butter, onion, broth, sage?” It was just a simple Sage and Onion Bread Stuffing recipe from her Better Homes & Gardens cookbook, but my mom knew how to season it just right. My Mom was very modest about her cooking abilities – yet to this day, I have never tasted a better Chicken Divan, potato-egg salad, turkey stuffing, or apple crisp. We all have our favourite recipes made by our mothers that we grew to love so much. My sisters and I have taken over the cooking for my side of our ever-expanding clan. We make the traditional, family-favourite recipes that Mom used to serve: my aunt’s Swedish Potatoes, Mom’s Sage & Onion Bread Stuffing, and Vegetables Supreme (from the first Fare for Friends cookbook). I only recently perfected my Grandma’s Stained Glass Window Cake recipe, which I cooked from a recipe scribbled down too hastily on a scrap of paper – it took me a couple of tries to get it right. I have my Nana’s Carrot Christmas Pudding recipe that I may try to make this Christmas. It’s so important to accurately record these heritage recipes to pass down to future generations. On that note, I have a really great idea I want to share with you. Why not create your own cookbook of treasured family recipes, photos and stories, and then give copies to family members as Christmas gifts? It’s far easier than it sounds. 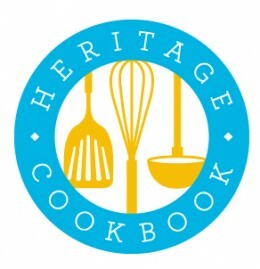 I have come across a fabulous website – HeritageCookbook – that allows you to easily create your own cookbook on-line, with a minimum order of only four cookbooks. Become a free trial-member for 30 days and invite as many people as you want to submit recipes and photos from their own computer, by logging on to your registration. You’ll have access to HeritageCookbook’s templates, photo library, and support. Most people complete their cookbooks within the free-trial month but if you don’t, the monthly fee is minimal. When you are finished, the cookbooks are printed on quality, coated paper with laminated covers. Though their customer base is largely American (the pricing on the website is in American funds), the company is Canadian-owned and the books are printed in Toronto. HeritageCookbook has printed over 200,000 quality cookbooks and has been recommended by Oprah, Rachel Ray, and one of my friends. The wheels are turning in my head. Which project shall I start with: a family treasury, a church fundraiser, or perhaps my own Olive to Eat cookbook? I can’t wait to get started. To both sides of our family – near and far, from the other side of the continent to the other side of the Atlantic, and to those we hold close in our hearts – I’m so grateful for the memories, old and new. Happy Thanksgiving. This recipe is from my Mom’s Better Homes & Gardens cookbook that she received as a wedding gift back in 1954. She made it every Thanksgiving and Christmas. The key to this simple, classic stuffing is to season it to your taste – but make sure you use lots of butter and sage. We always add more of each ingredient than the recipe calls for but never measure – so start out with the recipe, then slowly add more, tasting as you go along, until it tastes just right. Since the recipe only serves 4 to 6 people, you will likely need to multiply the recipe for a larger feast. If you are stuffing your turkey, calculate 1 cup of stuffing for 1 pound of uncooked turkey; don’t stuff your turkey until you are ready to put it in the oven; promptly remove any leftover stuffing from the cooked carcass and store separately in the refrigerator. I have heard a lot of talk lately about cooking your turkey unstuffed and cooking the stuffing in a separate baking dish. By the time you get the stuffing in the turkey’s cavity heated to a safe internal temperature of 165°F, you dry out the poor bird. Makes sense to me, so my recipe instructs you to cook it in a separate casserole while the turkey rests. Combine bread, onion, and seasonings in a large bowl; add butter and toss. Slowly add hot broth, bit by bit, until bread is just moistened. Taste and if necessary, add more onion, broth, butter, or seasonings, until seasoned to your taste. Toss gently to mix thoroughly. Place stuffing mixture in an ovenproof casserole; cover and chill until ready to bake. Preheat oven to 350°F. Bring stuffing casserole to room temperature before placing in preheated oven. Bake, covered, until hot throughout and flavours have melded together – about 30 to 45 minutes. Serve warm. Makes one 9”-square baking dish. I have my Mom’s handwritten copy of this recipe. She called it Apple Crisp – Dad’s Favourite and included a little story about the recipe’s origin – it was submitted to St. Andrews United Church in Chatham, by the mother of my aunt’s boyfriend in grade 4 in 1942. This is an easy – and I think more delicious – way to enjoy warm apple pie without the fuss of the crust. It is packed with tart apples and brown sugar and has a crumbly, cinnamon-scented streusel topping. The butter, spices, apple juices, and brown sugar meld together in a delicious mélange that caramelizes around the edges. It smells so wonderful cooking. Serve warm with vanilla ice cream – or perhaps Belly Ice Cream’s Caramel and Sea Salt. A note on cinnamon: thanks to some helpful advice from Chef Michael Smith, I have fallen in love with Vietnamese cinnamon. I couldn’t get my hands on the brand that Chef Michael uses but found McCormick Gourmet Organic Ground Saigon Cinnamon at my local grocery store – Longo’s Glen Erin. I compared the taste between Saigon Cinnamon, regular cinnamon, and a third gourmet organic cinnamon I picked up at another grocery store, all very recently. To me, the Saigon Cinnamon is the most aromatic, flavourful, and spiciest of the three cinnamons. 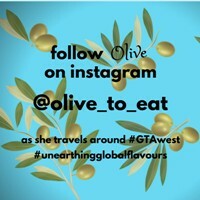 Olive it! Thank you Chef Michael Smith! Place oven rack in middle of oven; preheat oven to 375°F. In a large bowl, toss the apples with ¾ cup brown sugar and dash of nutmeg until evenly coated. Pour filling into a 9” square baking dish and level gently with a spatula. Add all topping ingredients (except butter) to a medium bowl; stir to combine evenly. Add butter to bowl; blend with your fingertips or a pastry blender to break down the butter into the flour until the mixture becomes crumbly, resembling coarse breadcrumbs without any large chunks of butter. Sprinkle topping mixture evenly over apples. Bake until apples are tender and topping is browned, about 35 minutes. Let rest 5 to 10 minutes before serving. Spoon into pretty cups and serve warm with vanilla ice cream or cold with whipped cream.